The main issue which is unfortunately not known to some cyclists: when you are riding along a facility for pedestrians, such as pedestrian crossing, you do not have the priority over cars! Pedestrians do. Bicycles do not. You get the priority if you dismount and pull the bike in your hands. I do not see any “discrimination” here, but a very natural logic instead. Pedestrian crossings are designed so that they are safe for the slowly moving ones. 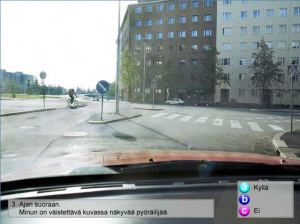 Car drivers have time to react accordingly to a human being walking at 5 km/h speed. Bicycles move faster, sometimes much faster than pedestrians, and there is not always enough time for a motorist to slow down after the cyclist is in the visible area. Thanks to fillarikesä blogi for the link!